Take a chance on change, you won't regret it! For the daring decorator who wants energy efficient, professional lights in a unique display we have the answer to your deepest design dreams. C9 color change bulbs boast vibrant morphing light, so when you can't decide if you want a purple bulb here or a green bulb there, let it go and light these up! Multicolor C9 color change LED bulbs, E17 base. The lights change colors and look decent around the house. They're decently bright for outdoors. I like the bulbs very much. 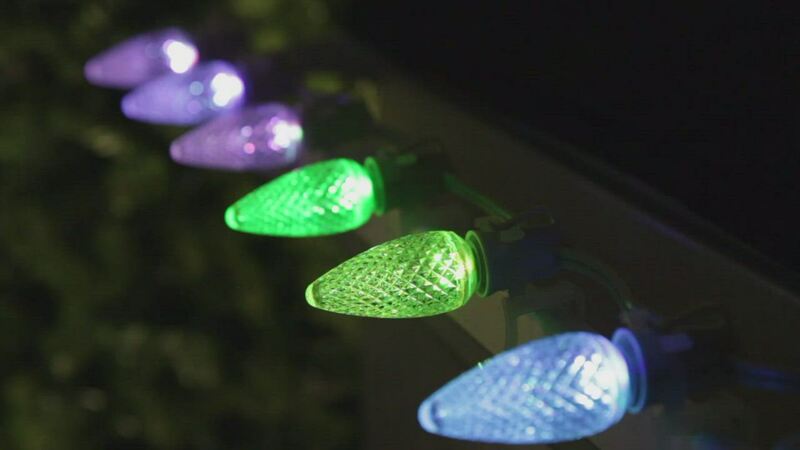 They add a nice dimension to our outdoor lights. These are exactly what they say they are. They slowly change through the full color range. They all start with the same color and slowly fall out of sync, which I love. My only complaint is that they are not quite as bright as my other pro quality C9 LED bulbs from Christmas Lights Etc. Still worth buying. Great product! Can't wait to set these up for the holidays. Decent amount of light output. Bulb Dimensions: 1.18" bulb diameter, E17 - Intermediate base size Lights: C9 LED Color Change: Red, Blue, Purple, Green, Gold, Faceted Acrylic, Non-Dimmable, Color Change, Nickel base.